If mainstream or commercial success is any indication of a band's success, then Unruly Child never quite had the fortune of others. 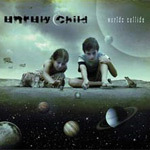 But nearly 20 years ago Unruly Child's 1992 debut left an impression on the melodic rock field, even during the demise of the genre and the rise of grunge. The band returns with the original lineup, including Marcie (Mark) Free, for Worlds Collide. And they have never sounded better. Some albums are good, and then some simply sound good across the entire disc. Such is the case with Worlds Collide. A combination of sound melodic song composition, generous hooks, immense and luxurious vocal arrangements, and skilled production make Worlds Collide pure melodic rock ear candy. Free's vocal performance can leave you breathless at times; her delivery soars with effortless abandon throughout with You Don't Understand, When We Were Young, Talk to Me, and Life Death real stand outs. The scope of Worlds Collide is AOR, very close to a West Coast sound, excepting the fact that Unruly Child can rock when ready. The opener, Show Me the Money, in particular, but also Insane and Neverland can kick out. Yet, the essence of Worlds Collide is smooth, ear-friendly, melodic rock, an exercise in catchy hooks driven by the harmonious vocal arrangements. Tell Another Lie, Love Is Blind, Talk to Me are exercises in AOR genius. The only thing that really bugged was the sometime inclusion of some quirking synths as on You Don't Understand. Otherwise, there is not a dull moment here, and Worlds Collide is simply well-crafted, AOR melodic rockmagic. Very recommended. There is not a dull moment on Unruly Child's comeback, Worlds Collide; this is simply well-crafted, AOR and melodic rock magic. Very recommended.